Turbula - Music - Review of "Under the Covers, Vol. 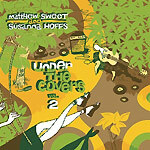 2"
Three years after teaming up for a collection of hits and forgotten gems from the '60s, indie rocker Matthew Sweet and '80s pop star Susanna Hoffs (The Bangles) re-join forces for a similarly fun run through the '70s. Gorgeously blended vocal harmonies, arrangements that hew to the originals and a roster of guest guitarists who can capture almost any sound from the '70s combine to elevate this album beyond homage or tribute. And that's despite the fact that  because of loyalty to the original arrangements and the duo's uncanny ability to seemingly channel the spirit of everyone from Todd Rungren to Todd Petty to the Grateful Dead  at times this comes off almost like one of those old budget price "greatest hits" collection popular in the 1950s through '70s in which no-name bands would try to re-create the popular songs of the day: "Wings Greatest Hits, as Performed by PJ and the Sound Explosion." Except that, unlike those bands, Sweet and Hoffs are stars in their own right  with established bodies of work that compare to the songs they're playing here. And when you can talk Lindsey Buckingham into laying down the guitar tracks for "Second Hand News" while perfectly capturing the vocal harmonies of Fleetwood Mac's original smash version ... well, the whole project moves from whatever it set out to be  covers, tribute or re-creation  into the realm of magic. Now, the entire album isn't at that heightened level. A cover of Yes' "I've Seen All Good People" never seems to find its footing, and Carly Simon's "You're So Vain" is so close to the original as to make this version seem a bit beside the point. And then there's the Bread cover  'nuf said. But having Hoffs' high, pure vocals take the lead on Little Feat's "Willin' " makes it different enough from the original to make you hear that song all over again; the same approach yields similar results on the Dead's "Sugar Magnolia." "All the Young Dudes" (Mott the Hoople) is likewise all goosebumps and admiration. With the '60s and '70s now interpreted by this superb pairing, we can only hope that either the '50s or '80s are next on their radar.